August saw the passing of another of Hudson's great dogs: Skye, whose full name was Morgan Skye Gryphon of Avalon. 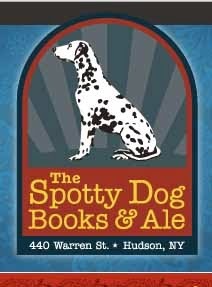 Skye was the original spotty dog who inspired the name and posed for the sign and logo of The Spotty Dog Books & Ale. The bookstore now has a tribute to Skye on its website. Skye was a great beauty and a sought-after model, even in her last days. (Skye was 14½.) Dan Rupe recently painted this portrait of her. Skye is greatly missed by her human, by her dog companion Gryphon (a.k.a. 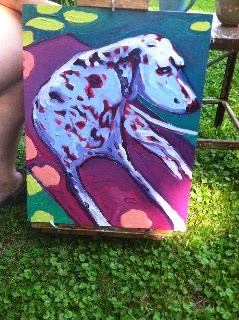 Deputy Dog Gryphon), and by everyone who enjoyed seeing her spotty self on her regular walks around town. These days, the Columbia County Fair ends on Labor Day. In 1914, the Chatham Fair opened on Labor Day. If you went to the fair in 1914, here is one of the exhibits you might have visited. 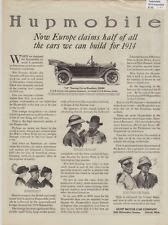 Automobiles were, of course, a relatively new thing in 1914. So much so that it was typical for it to be reported in the newspaper whenever a local resident purchased a car. 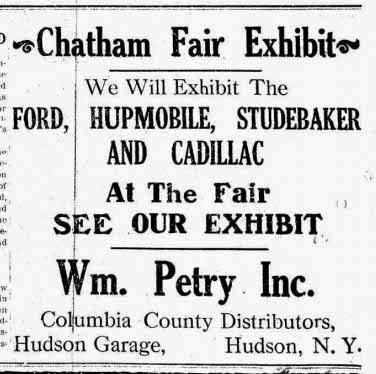 Much has changed in a hundred years, including the disappearance of two of the cars exhibited at the 1914 fair: the Hupmobile and the Studebaker. The first Hupmobile, named for its creator, Robert Craig Hupp of Grand Rapids, MI, was introduced to the public at the Detroit Auto Show in 1909. 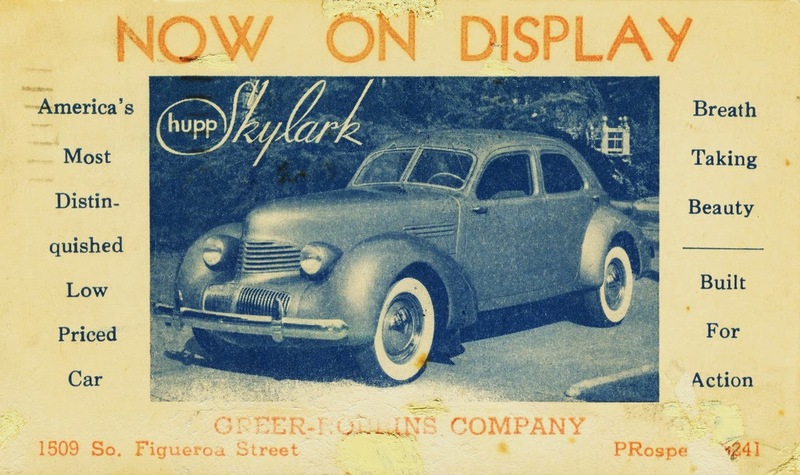 The last Hupmobiles were produced in 1940. Henry and Clement Studebaker were about a hundred years ahead of their time when they started making automobiles. Their first car, introduced in 1902, was an electric car. Thomas Edison bought the second one they produced. 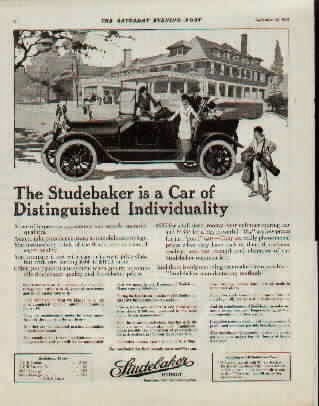 In 1904, however, the Studebaker Brothers Manufacturing Company began producing gasoline-powered automobiles. 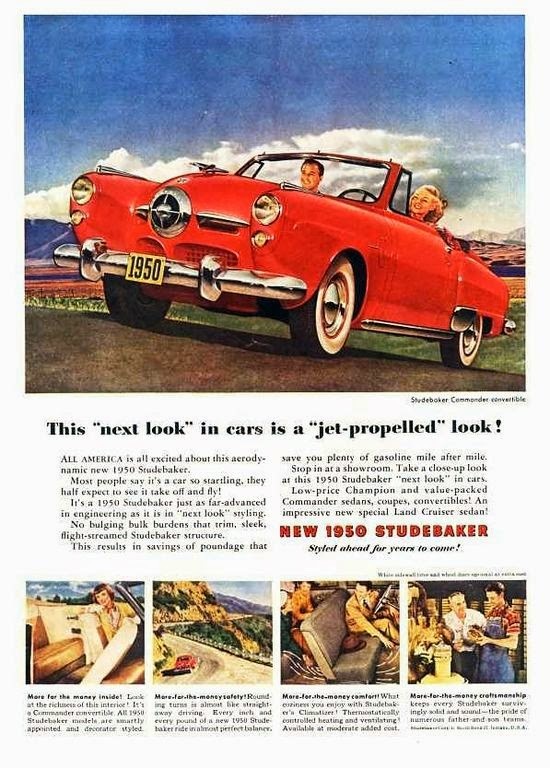 Studebaker produced its most memorable cars, those with the bullet nose design, in the 1950s, establishing Studebaker as a leader in automobile styling. 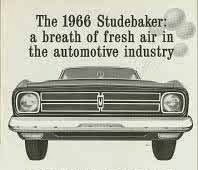 The last Studebakers were produced in 1966. If you missed seeing Zephyr Teachout in Ghent on Thursday night, you can watch video highlights of the event here. There is talk these days about appointing an ad hoc committee to study the city charter and recommend changes. 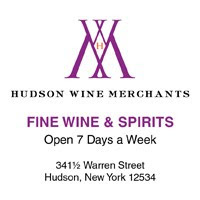 Hudson's charter was enacted in 1921 and amended in its entirety in 1973 (in the heyday of urban renewal--not that there's necessarily a connection), so it may be time to take a look at the charter again. A couple of things in the charter that many people seem interested in changing are the ward boundaries, as they translate into election districts, and the Common Council weighted vote. With this in mind, it is interesting to note that September 1 is the 100th anniversary of home rule in New York. To mark that anniversary, Gossips shares this article, which appeared in the Hudson Evening Register on September 1, 1914. Law Secured by Governor Glynn Goes Into Effect. 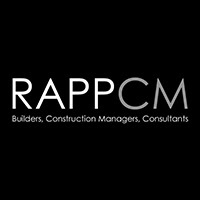 The Benefits of Optional City Charter Act. The cities of the state which have chafed under the necessity of going to the state legislature every time they desired to secure needed changes in their charter are now freed from the red tape which has bound them for the past twenty years. 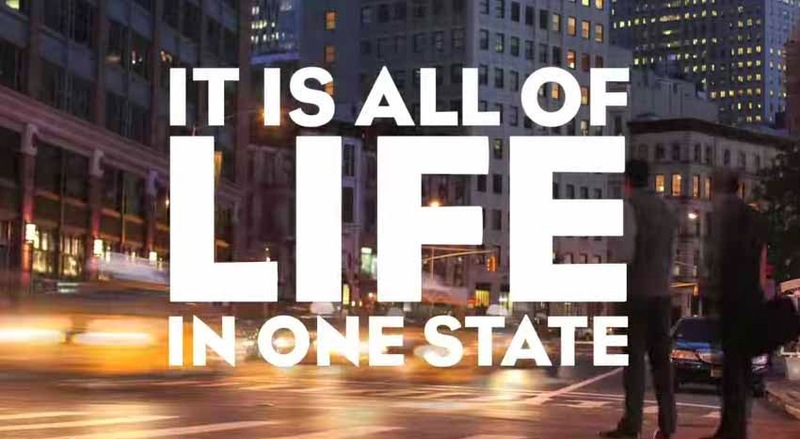 This month the optional city charter law goes into effect, and home rule for New York's cities becomes something more than a promise. To Governor Glynn and the Democratic party goes the credit for this reform in municipal government. Although the enactment of a law which would give to the cities of the state the right to select their own charters without interference from the legislature has been agitated for many years, it was not until Governor Glynn threw his influence to the support of this measure that it became a law. Party Pledge Redeemed. The optional city charter act formed part of the legislative program of the state conference of mayors and the Municipal Government association. Forty-two mayors petitioned the governor to urge its passage and because the Democratic platform of 1912 promised the fullest measure of home rule to the cities of the state Governor Glynn took it upon himself to redeem the party's pledge. The underlying principle of the new law is home rule. 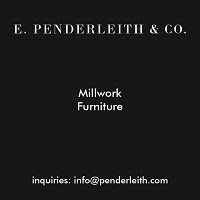 As its name implies, it is purely optional in character. 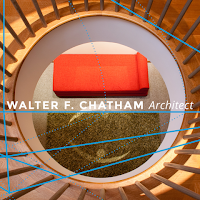 It does not impose any sort of charter on any city, but it does give every city the opportunity within certain limitations to choose the sort of charter that the majority of its voters want. Under the law seven optional forms of charter are offered to the cities. Two of these are variations of the so called commission form of charter under which approximately 400 cities in the United States are at present operating and which the legislature of 1914 provided for the city of Buffalo. 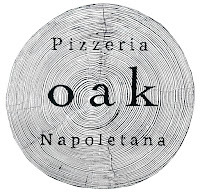 The third option provides a charter of the city manager type, similar to the recently adopted charters in Dayton and Springfield, O., and to that enacted by the legislature this year for the city of Olean. There is another form which provides for a mayor and a small council or commission of three or five members elected at large. Still another plan provides for a mayor and common council of nine elected at large. Still another provides for government by a mayor and a common council to be chosen from the existing wards. The seventh option is applicable to third class cities only. It allows them to adopt the White uniform charter law for second class cities with salaries on a lower schedule. The Short Ballot. Through all of these charters runs the short ballot idea. Even under the plan in which aldermen are chosen from existing wards the short ballot idea is maintained, the mayor and the aldermen being the only elected city officers. Under all of those forms such administrative officers as assessors, city engineers, city attorneys, city treasurer and comptroller are made appointive either by the council or mayor. There are three classes of officials, however, who will not be affected by the adoption of one of these charters. These are the county supervisors, who remain elective as heretofore, and the judicial officers and members of the boards of education, who remain either elective or appointive. Except as to the framework or structure of the city government the existing city charters will remain as before. The law does not pretend to provide complete new charters for the cities adopting one of these forms. It is clearly provided that all the existing laws and ordinances shall continue in full force and effect until repealed. The newly created legislative body may, however, reconstruct the charter to a considerable extent by superseding existing provisions of law by ordinances. The salary of the mayor and councilmen is fixed according to the population of the city. All other salaries of city officials may be fixed by the city council. The terms of office of mayor and councilmen under all the plans are four years, part of them being chosen every two years. Altogether the new law enables the cities of New York to live under the form of government best suited to the local needs and most in accord with local ideas. It relieves the cities of the state from the necessity of running to the legislature for every trifling change that is desired. 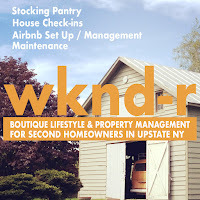 Best of all, it enables the state legislature to devote its whole attention to legislation affecting the entire state and prevents half of its time from being expended on local issues, half understood and of little concern to the majority of senators and assemblymen. Half Digested Legislation. In the regular session of 1914 more than 200 municipal bills of a purely local nature were introduced in both the senate and the assembly. Had the optional city charter bill be in effect this mass of half digested legislation could have been avoided. The legislature could have confined itself to state problems and adjourned a month earlier than it actually did. More important perhaps than the practical side of the question, however, is the principle involved in the legislation. The optional city charter law is a recognition that the cities of the state should govern themselves instead of being governed by a distant legislature, the members of which are not responsible, save in one or two instances, to the citizens of the affected cities. 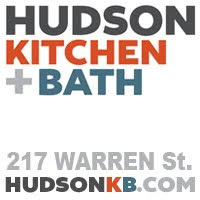 It is clear that the City of Hudson chose the sixth option: "a mayor and a common council to be chosen from the existing wards." 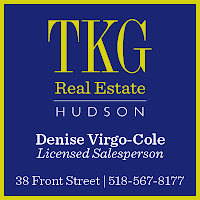 What is not clear is how and when the city treasurer became an elected position and why the elected officials in Hudson all have two-year terms. 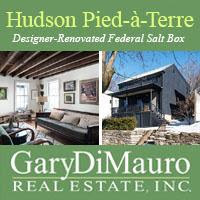 It has been mentioned at a couple of public meetings that the Hudson Development Corporation (HDC) is working on a master plan for the waterfront. 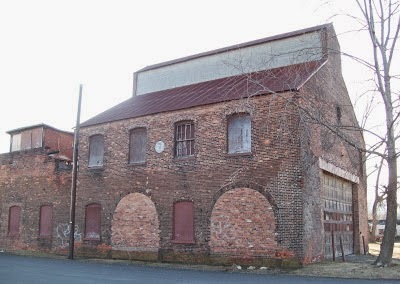 Relevant to that, Gossips discovered this morning that an RFP (request for proposal) has been issued for "qualified consultants to deliver a response to proposals for the engineering and highest and best use for the Dunn Warehouse located on Hudson's historic Waterfront." 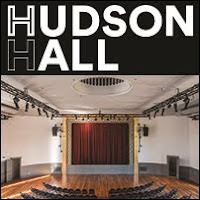 The City of Hudson is seeking an architectural/engineering consultant to provide professional services to:  Evaluate existing conditions within the Dunn Building, inclusive of all structural and building envelope elements; and  identify adaptive reuse possibilities for the structure. 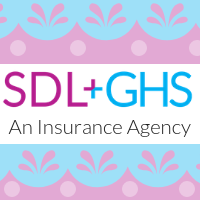 The deliverable must provide sufficient information for the issuance of a request for proposals for redevelopment of the building. The entire RFP can be read here. For the past couple of Common Council Legal Committee meetings, the mayor's proposal to remedy the problems of parking on streets around the hospital by introducing parking permits for residents has been on the agenda. It seems though that Mayor William Hallenbeck is not happy with the work the legislative branch has been doing on his proposed law. 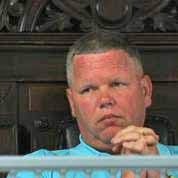 "They're turning my proposal into a monster by continuing to dissect [it]," the mayor told John Mason of the Register-Star. 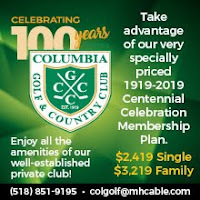 The mayor wanted work on the new legislation suspended after Columbia Memorial Hospital announced its new affiliation with Albany Medical Center, thinking that perhaps Albany Med's involvement might somehow change the game. The members of the Legal Committee rejected the notion that CMH's "strategic alliance" with Albany Med would have any impact on solving the immediate parking problems for residents of streets near the hospital and have been moving ahead. Mason reports on the latest struggle within local government in today's Register-Star: "Mayor wants parking plan put on hold." More than two years after Staley B. Keith's death, and less than two weeks after his daughter, Alderman Alexis Keith, complained at a Common Council meeting that nothing had been done to fulfill Mayor William Hallenbeck's promise to designate the place where Carroll, Prospect, and Short streets converge with Harry Howard Avenue as "Staley B. Keith Circle," a stone appeared yesterday in the little grassy triangle. 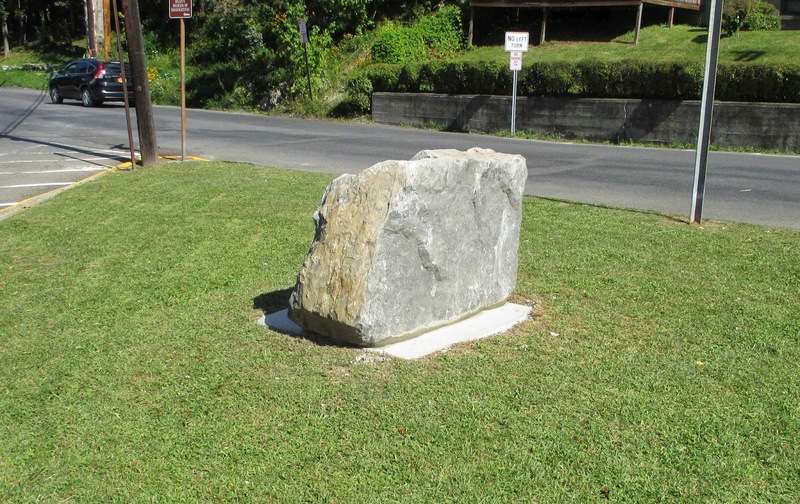 It is expected that a bronze plaque commemorating Keith will be affixed to the stone. Andrew Cuomo had indicated that he would make his decision about debating Zephyr Teachout by 7 p.m. yesterday, but at 7 p.m. yesterday, when Teachout walked into the Ghent Town Hall and was greeted by a standing room only crowd, there had been no word from the governor. Teachout's visit to Ghent last evening was her seventh stop that day on a Whistleblower Tour of the state. 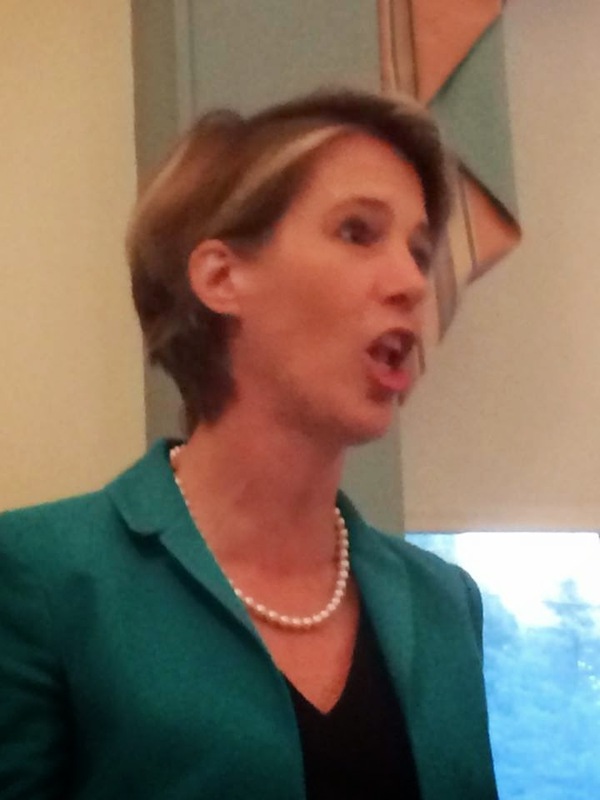 "We are blowing the whistle on the corruption we see," Teachout explained. "They're calling the shots, and we're calling them out." Applause greeted her every utterance, until she pleaded good-naturedly, "Stop clapping, because I've got some talking to do." Defining herself as a traditional Democrat, Teachout declared her support of public education, saying that Cuomo has "looted schools to pay for tax breaks for the wealthiest New Yorkers." She stated her commitment to maintaining and repairing the state's infrastructure, dissed using Clean Water Act funds to pay for the Tappan Zee Bridge, and spoke of "a public transit system we haven't imagined yet." Applause erupted again when Teachout declared that, as governor, she would ban fracking in New York. "Our water is everything," she said and then quoted Franklin Roosevelt: "A nation that poisons its soil poisons itself." "FDR is my guy," Teachout explained. 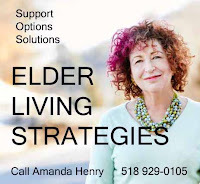 She called for "reinvesting in the public," objected to "contracting out basic public services," and asserted that "a society should be measured by how it treats its most vulnerable members." The Democratic primary for governor and lieutenant governor takes place on Tuesday, September 9. Polls are open from noon until 9 p.m.
At last month's Common Council Legal Committee meeting, Alderman John Friedman (Third Ward), who chairs the committee, announced his intention to invite Richard Cohen, the owner of the buildings on the northeast corner of Warren and Fourth streets, to come to the next Legal Committee meeting to discuss the current condition of the buildings and explain his plans. 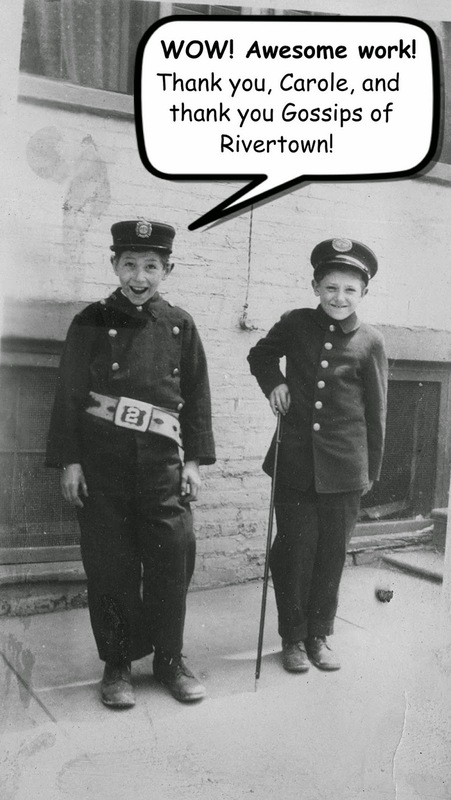 The term being bandied about at the time was "demolition by neglect." Cohen was present at the Legal Committee meeting on Wednesday night. Earlier in the day, he had met with assistant city attorney Dan Tuczinski and code enforcement officer Craig Haigh. 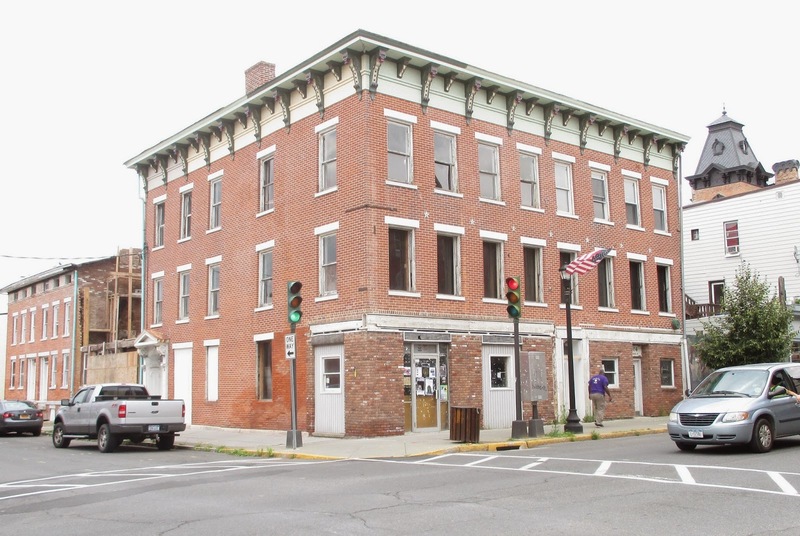 At the Legal Committee meeting, Tuczinski reviewed the situation at the site: there are questions of public safety; the project is out of compliance with city code; no working plans for the building that have been filed with the code enforcement office or approved by the Historic Preservation Commission or the Planning Board. Tuczinski reported that the City had requested a letter from a structural engineer attesting that the site was safe. Tuczinski also indicated that a building permit was needed for the work now being done at the site, and Cohen had to present the "ultimate plans" for the site to the appropriate City regulatory agencies. 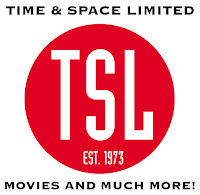 "Time is of the essence," said Tuczinski. 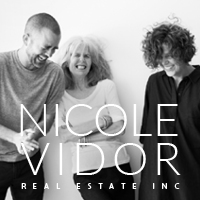 "It starts with the building office." When Friedman asked if there was anything he wanted to add, Cohen said that the stabilization process, which he said had taken five years, was almost complete. He predicted that it would be done by the end of September. 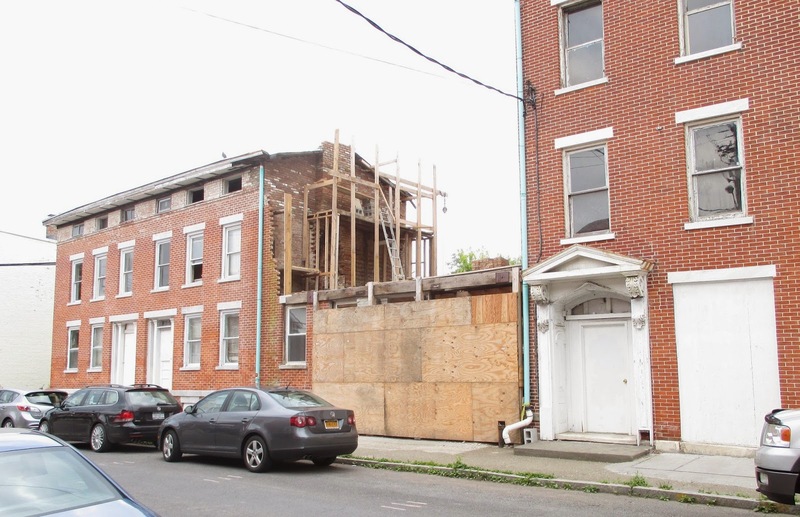 He indicated that the facade of 8 North Fourth Street would be "completely dismantled" but made assurances that "we are keeping whatever materials we can." When asked if he had a plan for "what ultimately will be there," Cohen's response was only that they would be rebuilding the wall at 10 North Fourth Street. Friedman concluded, "It sounds like everybody's talking, which they were not before." He asked Haigh to prepare a report for the Legal Committee and then declared the project "off the Legal Committee's agenda for now." Rumor has it that Cohen was recently offered for the buildings an amount, in cash, that most of us could only hope for if we won the lottery, and he turned it down. If you missed seeing and experiencing BUMP, the interactive exhibit of whale bones at Basilica Hudson, you have another chance this weekend. The exhibit is open on Saturday and Sunday, August 30 and 31, from 1 to 4 p.m., and on Labor Day--Monday, September 1--as well. The installation, made up of bones from three different whales, is the creation of Daniel DenDanto and Frank DenDanto. Daniel is a cetecean biologist; Frank is a light and theater designer. The brothers have collaborated previously on whale skeleton articulations for museums, but BUMP is their first exhibit centered around an educational and interactive fine art approach rather than a traditional scientific assembly. BUMP was first exhibited at the Maine College of Art and has also been shown at the Institute of Contemporary Art in Portland, Maine. 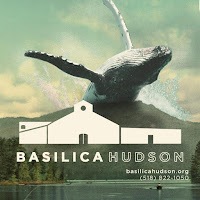 "Bringing BUMP to Hudson," says Basilica creative director Melissa Auf der Maur, "reflects Basilica's commitment to the rich history of our region and the Hudson whalers, who played a big part in what we love about Hudson today." 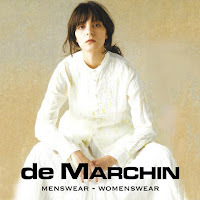 Tomorrow night--Friday, August 29--there is a closing party with "an intimate, early music vibe." The a capppella trio Black Sea Hotel will be performing "electrifying arrangements of Balkan folk songs, interweaving the ancient and the contemporary in a harmonic blend that has been called otherworldly, haunting, even spellbinding." Also performing will be Charlie Looker, whose haunting voice and guitar create music that ranges "from early music to demented covers," and Patrick Higgins, who's been described as an "electrified Bach for the classical guitar." 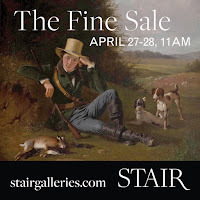 The doors open for the party at 8 p.m., and the music begins at 9 p.m. Tickets are $10 at the door. If you missed seeing and hearing Zephyr Teachout, the Fordham law professor who is challenging Andrew Cuomo in the Democratic primary on September 9, when she was in Hudson a few weeks ago, you have another chance tonight, provided you are willing to drive to Ghent. 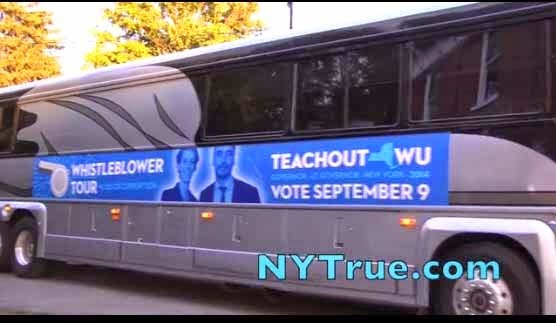 Tonight at 7 p.m., Teachout and Timothy Wu, who is challenging Kathy Hochul to become lieutenant governor, will be stopping at the Ghent Town Hall on their Whistleblower Tour of the state. Ghent Town Hall is located at 2306 Route 66, on the left, just before the Dairy Queen. The Democratic Primary is Tuesday, September 9. The polls are open from noon to 9 p.m. If you are not going to be in Hudson on September 9 and need an absentee ballot, click here for an application. Completed applications must be mailed to the Board of Elections seven days before the primary or hand-delivered to the Board of Elections office at 401 State Street on the day before the primary. 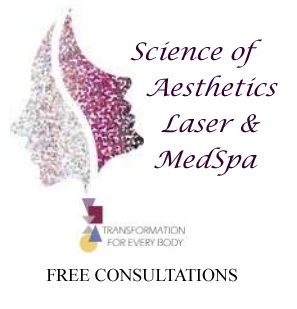 If you have questions, call 518 828-3115. 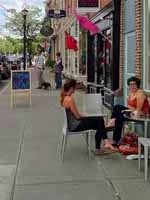 Warren Street is the scene when it comes to commerce in Hudson. 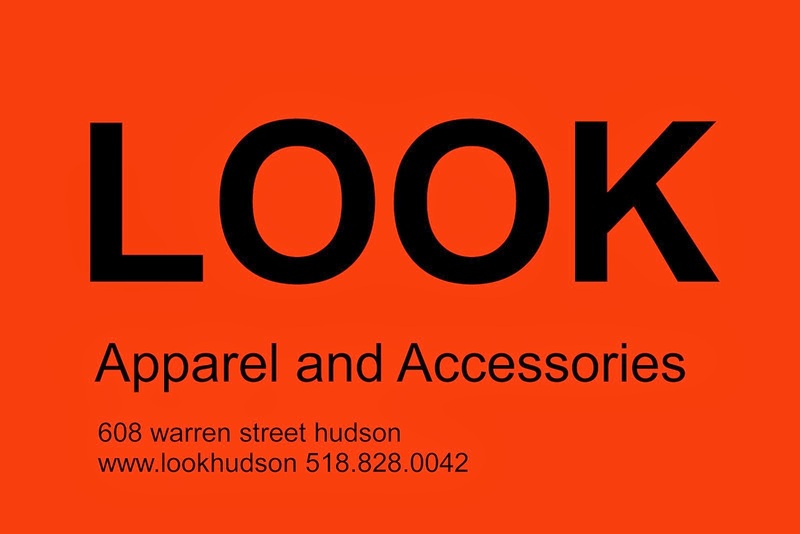 It's where people who come to Hudson for a day of shopping and exploring gravitate. It's where the action is. It's understandable then that people with businesses near but not on Warren Street would want a sign on Warren to steer folks in their direction. It's also understandable that in fine weather, when the restaurants set out their sidewalk cafes, the sidewalks get crowded. 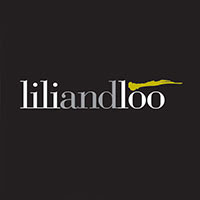 Then there are the vendors and other alternative forms of retailing that want to be part of the scene. All these issues--the downside of Hudson's success and vitality--were taken up at last night's Legal Committee meeting. John Mason reports on the discussion in today's Register-Star: "City sandwich boards in peril." 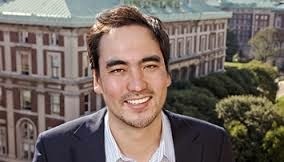 The New York Times has endorsed Timothy Wu, a Columbia law professor, for lieutenant governor of New York, not Kathy Hochul, the former congresswoman who is Governor Andrew Cuomo's choice: "Timothy Wu for Lieutenant Governor." The primary election is on Tuesday, September 9. In Hudson, there are only two Democratic races: for governor and for lieutenant governor. The polls are open from noon until 9 p.m. 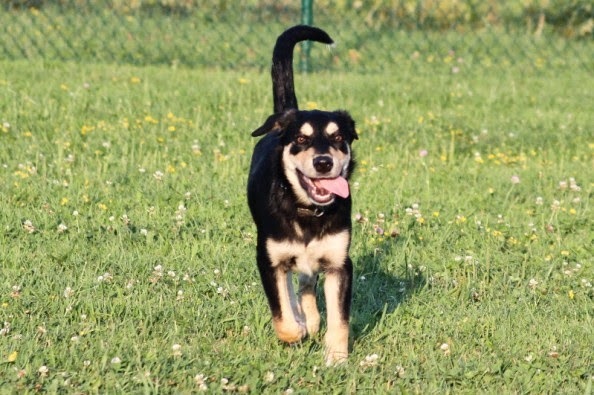 The campaign to raise funds for a dog park in Hudson has reached the halfway mark. The goal is to raise $10,000; so far, there is $5,000 in the Hudson Forward Dog Park Fund. Click here to make your contribution and help create a park for our canine citizens. Among the boats built in the Hudson Sloop Club's summer camp program and launched on the river last Friday was this swift and beautiful canoe made from paper. It turns out that, far from being a bizarre novelty, paper boats, made from a form of papier-mache, were very popular in the latter half of the 19th century. Before there was fiberglass and composite plastic, paper was used to build light and fast racing shells, canoes, and rowboats, and the leading manufacturer of paper boats was E. Waters & Sons, Paper Boat Builders, just up the river in Troy. You can learn much more about the Waters paper boat factory and about paper boats in general at an amazing website called Ken's Paper Boat Page. This is all by way of introducing the news that a flotilla of paper boats from Troy is due to visit our part of the river on September 1 and 2 as part of a collaborative art and activism project called SeaChange. 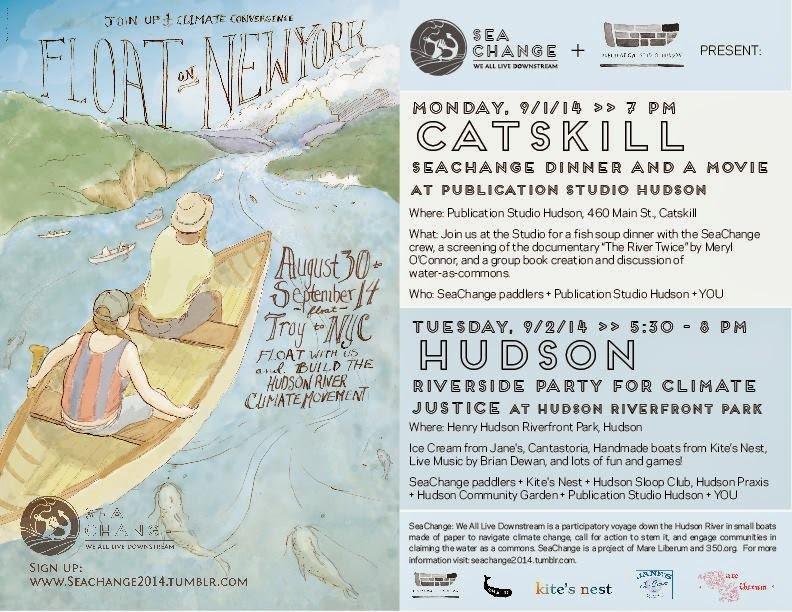 On Monday, September 1, the SeaChange crew will be guests at Publication Studio Hudson in Catskill for dinner and a movie. Dinner is fish stew; the movie is The River Twice, a documentary by Meryl O'Connor about floating on the North Branch of the Susquehanna River. The event starts at 7 p.m. 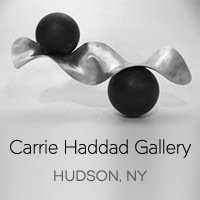 Publication Studio Hudson is located at 460 Main Street in Catskill. On Tuesday, September 2, the paper boats will be on our side of the river for a Riverside Party for Climate Justice at Rick's Point in Henry Hudson Riverfront Park. 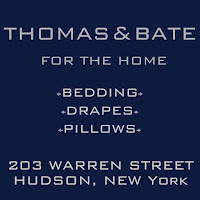 Paper boats from Kite's Nest and the Hudson Sloop Club will join the SeaChange paddlers on the water, while on land, there will be food, ice cream, and live music. Hudson Praxis, Hudson Community Garden, and Publication Studio Hudson will also be part of the event, which begins at 5:30 p.m. and goes on until 8 p.m.
Arthur Cusano reports, in today's Register-Star, on the reaction at last night's Board of Education meeting to the notion of developing 33 acres of land belonging to HCSD for market rate housing: "City school officials unsure of property deal." Yesterday, Zephyr Teachout, who is challenging Andrew Cuomo to be the Democrats' candidate for governor of New York, was endorsed by the New York Chapter of the Sierra Club. If you haven't already done so, take three minutes to watch this video: Zephyr Teachout: Two Futures. It delivers a very compelling campaign message. 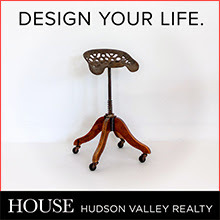 The Democratic Primary--the only primary in Hudson--is Tuesday, September 9. 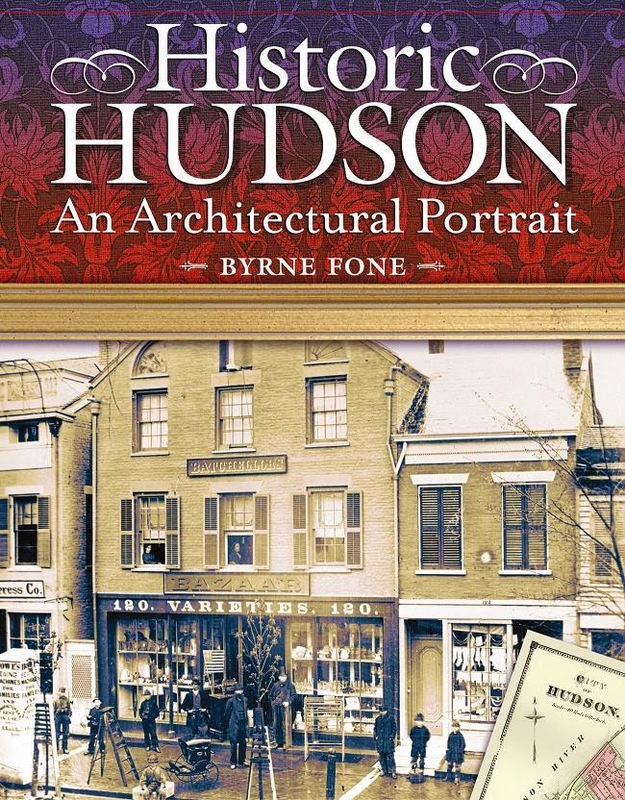 The polls are open from noon until 9 p.m.
Last October, Gossips reported that Byrne Fone's beloved and valued history of Hudson, Historic Hudson: An Architectural Portrait, was out of stock, and there was a chance it might not be reprinted. 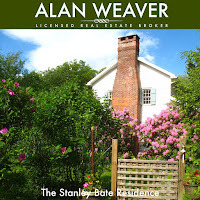 Almost a year later, the good news is that the book, which was originally published in 2005, has been reprinted, and copies from the new run are now available at The Spotty Dog, Hudson City Books, and Rural Residence. 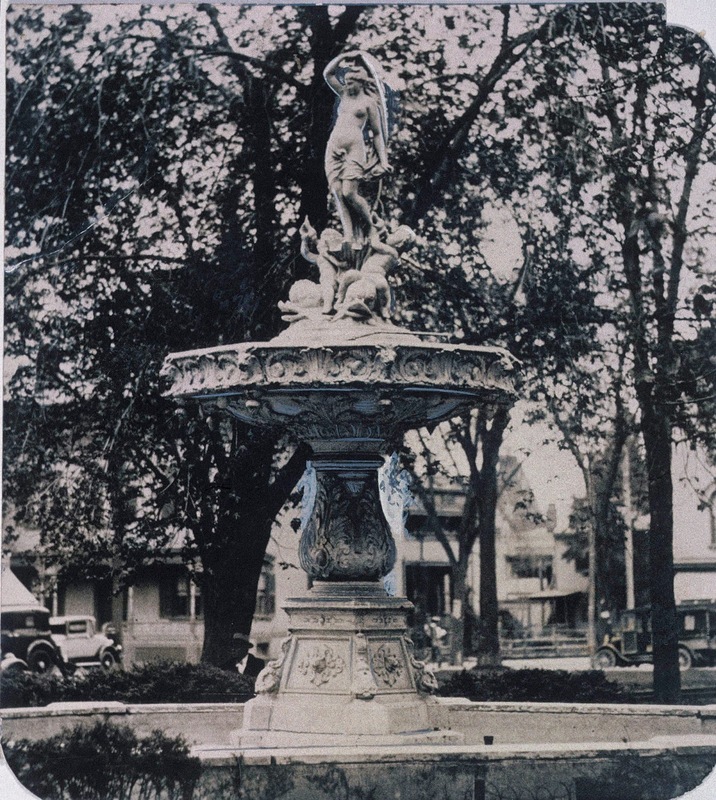 Unless the responses to the Seventh Street Park survey prove otherwise, it appears there is overwhelming support in Hudson for restoring and/or re-creating the Venus fountain, which was originally installed in the Public Square in 1883 and replaced, in 1975, by the "Inspiration Fountain," in an attempt at beautification and modernization. Much abused and twice repaired, the statue of Venus, which surmounted the fountain, has been in storage since 1998. According to some accounts the stone pedestal, which was also the top pan of the fountain, was pulverized at Gold's Scrap Yard in 1975. Gossips recently heard, however, the totally unsubstantiated rumor that the pedestal lives on in someone's backyard, but probably not in a backyard anywhere in Hudson. It always seemed that the fountain was so well documented--its dimensions were published in the newspaper, and countless images of it exist in archives and on post cards--that it would be possible to replicate the missing pedestal. 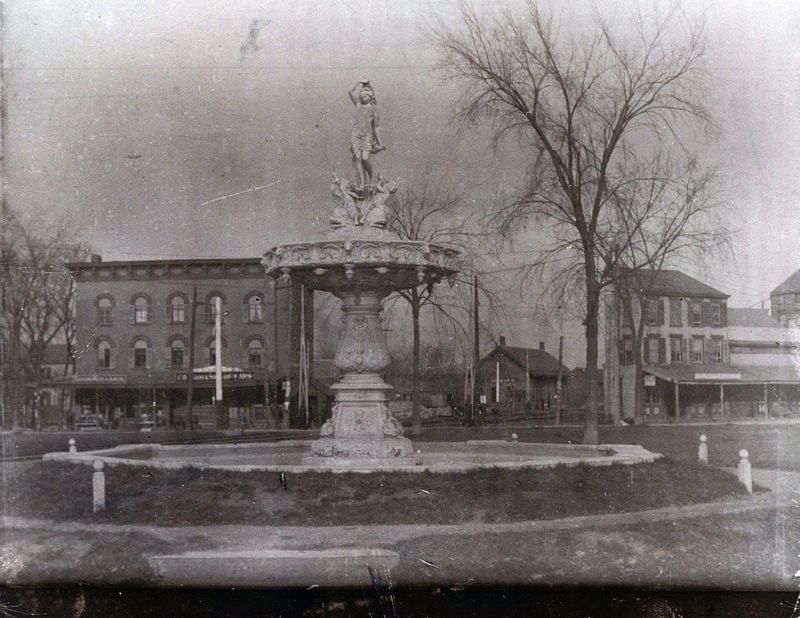 These two images, however, recently brought to Gossips' attention, from the Evelyn and Robert Monthie Slide Collection in the Collection of Columbia County Historical Society, reveal the details of the fountain better than any images we've seen before and make the task of replicating the pedestal even more possible. 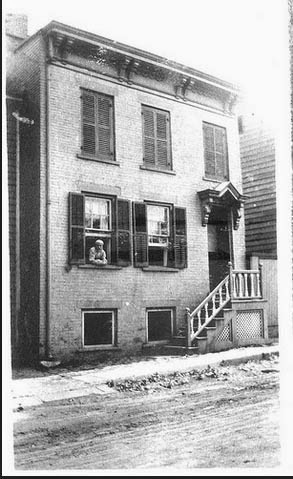 This morning, one of the children of Herbert Meicht confirmed that the house that figures largely in the mystery photo album is indeed 38 Chapel Street, where Ezra and Emma Meicht lived and raised their three children: Clarence, Herbert, and Mildred. Mystery solved! 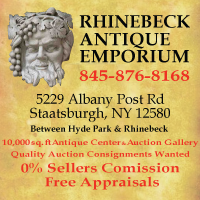 Last Sunday, Gossips appealed for help in identifying the family whose picture album, dating from the 1910s through the 1920s, had found its way to an antique shop in South Burlington, Vermont. A week later, thanks to a terrific lead from a loyal Gossips reader, the mystery is as good as solved. 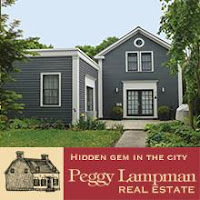 Although the search continues for a picture that will provide proof positive, it seems pretty certain that the mystery house is 38 Chapel Street--a house and a street that are no more. At the time the photos in the album were taken, the house was owned by Ernest and Emma Olm. According to the 1920 census, Ezra and Emma Meicht also lived in the house (Emma was Ernest and Emma Olm's daughter) with their two sons, Clarence, then 5, and Herbert, 4. 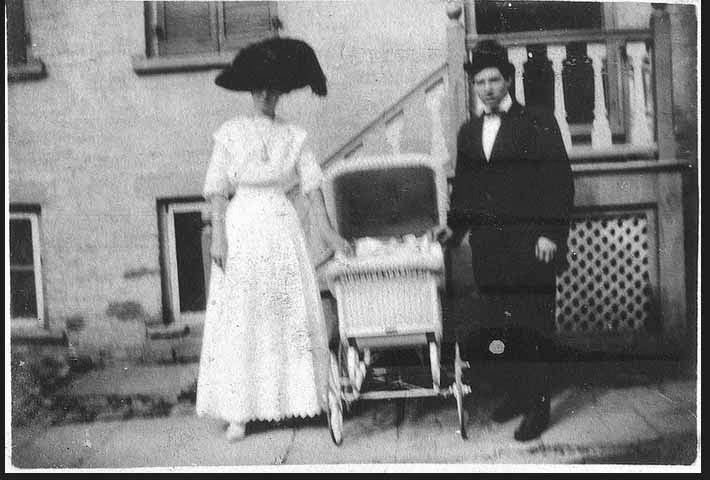 The young couple in the picture below is believed to be Emma and Ezra Meicht, and it may be Clarence, whose birth was announced in the Hudson Evening Register on May 19, 1914, who is in the baby carriage. Ezra Meicht worked as a machinist at the Gifford-Wood Company, which would explain the pictures of the Gifford-Wood Company in the album. 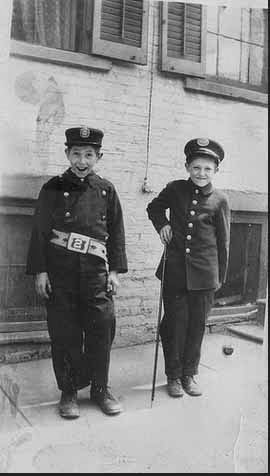 He was one of two assistant fire chiefs in Hudson, which would explain the firemanic outfits worn by the boys, believed to be Clarence and Herbert, in this picture. 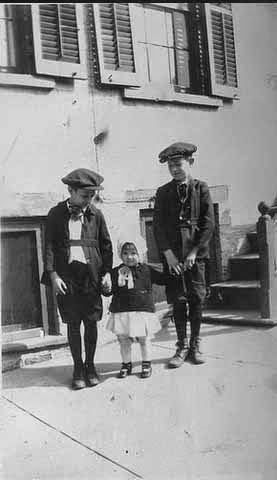 Ezra and Emma Meicht also had a daughter named Mildred, and it is believed that this is baby Mildred in the picture below, with her two older brothers. So far, this detail from a 1970 aerial photograph of the part of Hudson targeted for urban renewal is the only picture that has been located of 38 Chapel Street. If you have pictures of Chapel Street, please contact Gossips. If you are a descendant of this family and would like to claim the album, the contact information for the people who have it and are seeking to return it to you can be found on Flickr, along with more pictures from the album. 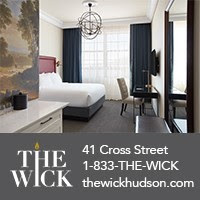 It has been determined that, although in the past the City has pestered CSX to make repairs to the Ferry Street Bridge, the City has owned the bridge all along, so it's up to the City to deal with the historic bridge that Alderman Nick Haddad (First Ward) recently called "the ticking time bomb in Hudson." At its meeting on Tuesday, the Common Council passed a resolution allocating $30,000 for a feasibility study on replacing the Ferry Street Bridge and authorizing the mayor to "solicit for and enter into a contract" for such a study. On Thursday, at the Economic Development Committee meeting, Council president Don Moore instructed Bill Roehr of TGW Consultants, the group that is retained by the City and Hudson Development Corporation to identify potential grant funding and prepare grant applications, to focus all efforts on finding funding for the bridge. Alderman John Friedman (Third Ward), however, declared, "We need emergency funding tout de suite." He went on to say, "We can't wait for the grant cycle--it's too political." Friedman seemed to think one of the sources of funding might be Columbia County, implying the the County had money available for such things when he observed, "Bridges throughout the county get fixed"--overlooking the bridges in Columbia County that have been closed rather than repaired. It is expected that a new bridge over the railroad tracks to the riverfront will cost $2 million--"more," Moore opined, "if we want it to have any character." In the past, Moore has spoken of the possibility of retaining or replicating the more visible parts of the 1905 bridge, the historic significance of which rates 7 on a scale of 1 to 10. Haddad stressed the urgency of the situation by saying, "The moment this [feasibility] study comes in, we have to fast-track it." He then expressed a different concern: "The more attention we bring to this bridge, we may end up with it closed." 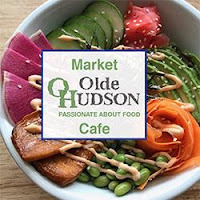 At the Common Council meeting on Tuesday, Council president Don Moore proposed a resolution that "the City of Hudson forthwith initiate discussions with the Hudson City School District . 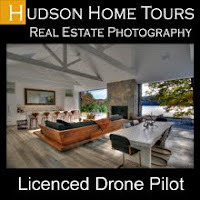 . . to convey [a parcel of unused land] to the City of Hudson for development of market rate housing." 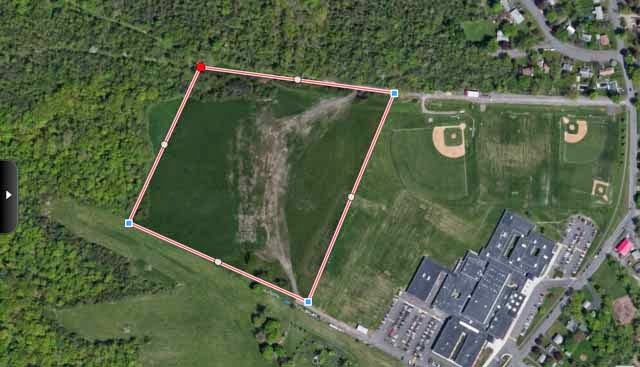 The parcel in question is about 33 acres of land west of the Hudson Junior and Senior High School campus, near the border with Greenport. When the idea was presented, the mayor immediately wanted to know if it had been discussed with HCSD. At the time, it hadn't, but on Thursday, at the Economic Development Committee meeting, Moore reported that a discussion with HCSD had been initiated, and the school district was open to the idea. The thinking behind the proposal is that, because the City of Hudson needs to increase its tax base and the revenue the school district requires increases inexorably every year, it makes no sense for HCSD--a tax exempt entity largely supported by property taxes--to own property that is unused and generates no tax revenue either for itself or for the City of Hudson. 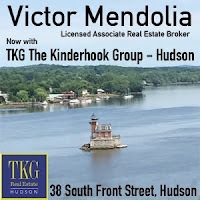 The idea is to encourage private development of new housing on this 33-acre parcel to create new property tax revenue for both the City of Hudson and the Hudson City School District. When Gossips asked Moore about the nature of the housing envisioned for the site, he reiterated that the resolution specified market rate housing and suggested that "arguably there could and should be both" individually owned homes and apartments. In a subsequent email, Moore stated, "The desirability of the location is clear. 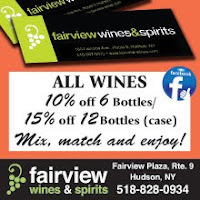 It has access to the center of Hudson, to the Middle, Junior and High Schools, to merchants on Fairview Avenue, and to the existing and planned recreation and conservation areas along the river." He went on to say, "I foresee a complex set of land use master planning, negotiations and agreements between the School District and the City to arrive at a point where everyone is confident in the character of the project." Moore believes that the City--represented by the Council, the mayor, and Hudson Development Corporation--and HCSD are in earnest to begin discussions of the possibility. Click here to read the draft resolution. and the party boat, kept afloat by platoons made with about 500 empty plastic bottles. 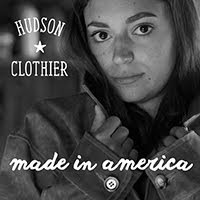 Congratulations to the Hudson Sloop Club and all the talented young boat builders! How Big Should an Apartment Be? "Cirque du Soleil Meets Occupy Wall Street"